I’ve talked about the origin of Itadakimasu and the significance of Mottaitai. Today i want to talk about this word called “umami“, it’s not a phrase like itadakimasu or mottainai, but still related to food, veeeery yummy food, because i know you guys love eating XD. You may have heard of umami, since there’s the famous “Umami Burger” in the US. But what is it? If you watch anime or Japanese drama, i’m sure you know the word umai, which means “delicious“. And mi means taste, simply: “delicious taste“. So, without umami, a food is simply just sweet, salty, sour, or bitter. But sometimes you eat something so good you don’t even know how to describe it. Now we know umami. The 5th taste human tongues can perceive. Kikunae Ikeda discovered umami in 1908 while he was drinking a bowl of soup prepared by his wife using Konbu. She was a very important wife who was using a very important piece of seaweed that changed the destiny of food. I wish i can invoke such enlightenment too by putting random stuff in my husband’s soup lolol. Anyway it was discovered that umami can be found in a lot of natural foods. In Japan, the most umami-rich foods are konbu (kelp) and katsobushi (dried bonito flakes), which is why the basic ingredient to make dashi (Japanese soup stock or broth) is always konbu + katsuobushi. You can do this at home! Just put dried bonito flakes in a stock bag, boil together with konbu for a few minutes in a large pot and you will have a pot of dashi right there. Simplest natural soup stock in the world. So right, what exactly is in konbu and katsubushi that makes them the king and queen of umami? The answer is Glutamate. And Glutamate gives the taste of umami. The genius professor Ikeda then mixed this element with ordinary salt and water, to create monosodium glutamate, which has now become the world most notorious food enhancer called the MSG, and patented it. Professor Ikeda also created his company who mass produced MSG spreading the umami culture like gospel all around the world, and it is called Ajinomoto. When I read that my already mushy brain combust again. Since young, my family has always been very health conscious, and try not to eat outside food that had a lot of “Ahjinamoto” (that’s what we called it). And Ahjinamoto, to us, was basically poison. And we avoided it at all cost because it will kill you like a lethal venom. A couple of decades later, I met the danna and when we first moved in together, he bought a bottle of Ajinomoto shaker during a grocery shopping trip. I was very surprised. “Isn’t this thing very bad for your health?” I asked, suspicious. The danna just shook his head and laughed. “Every family has it in Japan,” he mused. In my heart I thought all the Japanese moms were crazy for knowingly slow-murdering their husbands and kids. I know, right. If you came to my house and saw the bottle of crystalized MSG, you were for sure going to give me that look that says OMG YOU EVIL HOUSEWIFE YOU ARE POISONING YOUR WHOLE FAMILY TO A SLOW AND PAINFUL DEATH. Ever since I took charge of the kitchen (the life of a housewife lol), I threw it away secretly. But, the Japanese has no fear of MSG. I wondered why. Being one of the most health conscious nations in the world, they are eating cup noodles and ramen like they can’t live without them (they can’t). I don’t want to bore you with long arguments on how MSG is not any more poisonous than a chargrilled rib eye steak (and honestly, salt is maybe even worse than MSG if not just as bad), but after reading up quite a fair bit on the topic, I have decided to bring back the Ajinomoto in my house. True, all these while I had the impression that Ajinomoto is made of pure evil chemical, I mean, even the appearance of it looks artificial! But now I realized, yes, it is chemical, but in the same way as water is too, as H2O. Ajinomoto sounded scary because it is so so affordable. I mean, good things cannot come cheap, right? If it is cheap it means it is non-organic and probably contain stuff that is made of chemical lab waste that will make your brain melt. Ajinomoto, is “Aji no moto” (味の素）, which literally means, “the essence of taste”. 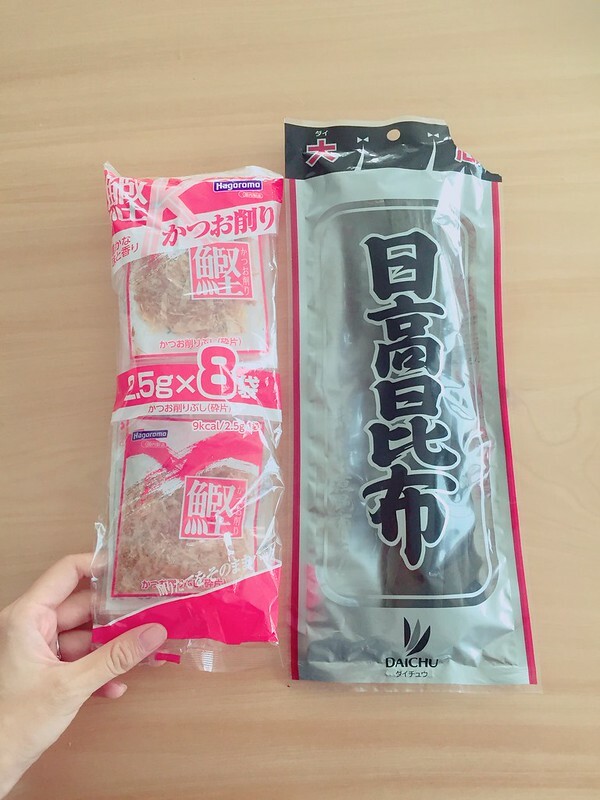 Which is umami. The Malaysian Ajinomoto says that the glutamate is derived from “ubi kayu” (tapioca), “tebu” (sugar cane) and “sagu” (sago). Until today, no one single study has found evidence that MSG will cause any harm, and if it does, it will have vanished from Japan because they have ridiculously strict food safety policies. I had avoided Ajinomoto like plague for my entire life, but now I think it is time I see it in a whole new light and give it a new definition. I just feel a small need to defend it as many people shy away from the brand because of the negativity it is associated to. But Ajinomoto is awesome. Most of my frozen food for emergency times are from Ajinomoto. Most of the time it uses only “safe food” (meat or vegetables from their very own specific farms. Japanese are very suspicious of “unknown sources”). If you go to ISETAN KLCC, please buy the Ajinomoto prawn Siew-Mai. It was the best Siew-Mai I’ve ever eaten in Malaysia LOLOL. It is my and the danna’s favorite. When I was in my early pregnancy I ate so much of it because it was about the only food I could swallow when almost all other food repulsed me no to end. I’m quite sure you get your fair share of MSG from it but hey, Japanese still live the longest in the world. MSG could even be beneficial (say what?!?). Did you know that umami enhances the taste of food (like switching food into freaking ultra HD mode! If you put it in egg the egg tastes more eggy and if you put it in chicken your chicken tastes more chickeny)? If a food contains a lot of umami, the food will taste generally richer even if the salt content is minimal. Which means, you can reduce your salt intake by adding extra umami in your food. It could be beneficial for the elderly and babies. Of course I’m not saying that you should go sprinkle MSG in your baby’s formula la. What I am saying is that, if you can identify the umami-rich foods, you can use the natural power to create secret flavor-bombs that will get your entire family hooked (and flaunt it if you want lolol). Of course sometimes you can cheat too with a bottle of Ajinomoto as short cut. Just don’t let anyone see it. It’s embarrassing. *guilty* I mean, mothers who don’t use Ajinomoto will always stay the better mom right? Or so everybody judges. 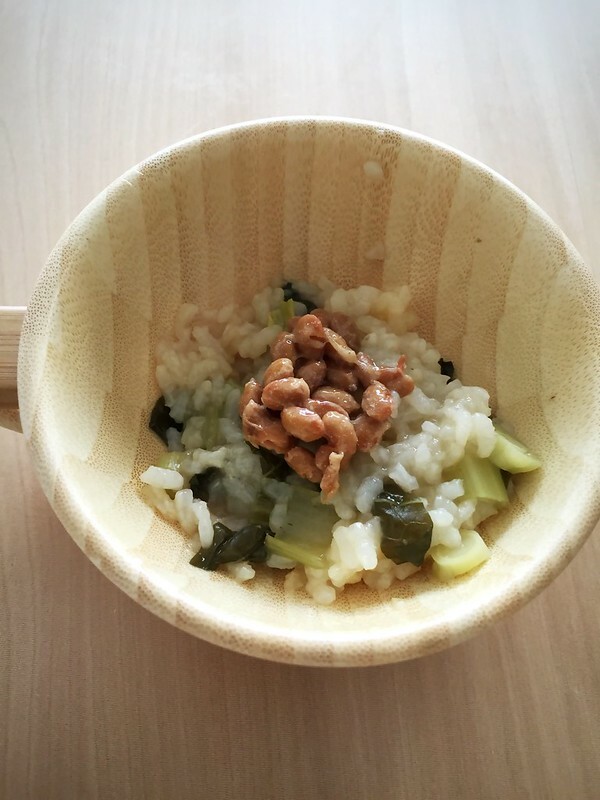 When Junya was younger, maybe 7-8 months, I cooked his soup and porridge with dashi (konbu and katsuobushi) with no added salt because everyone knows too much sodium is no good for baby’s weak digest system right. And I noticed that he loved food infused with dashi (soup, stew, porridge) more than food without (steamed vegetables, bread, fruits). Until today, Junya loooooves soup the most. Even with no salt added, he down it like a champion. And I am now a true believer in umami. While mothers are mothers and I admit I am one of those who will opt organic over cheap and vague baby food jars, it is also nice to know that now I don’t have to be so paranoid to decode every single food label (since MSG also comes in many other fancy names undercover). So yea. I just solved a myth for myself!! It’s of course up to a person to believe and debate since it’s still a very much controversial food topic. I’m including a few links I found that covers the topic of MSG extensively (at the end of the post). Also, the danna introduced me to Rokunosuke, a brand that produces salt. One of his famous chef friends told him that Rokunosuke is the ultimate secret to his cooking that get all his customers hooked forever. Because it is the most delicious salt in the world. 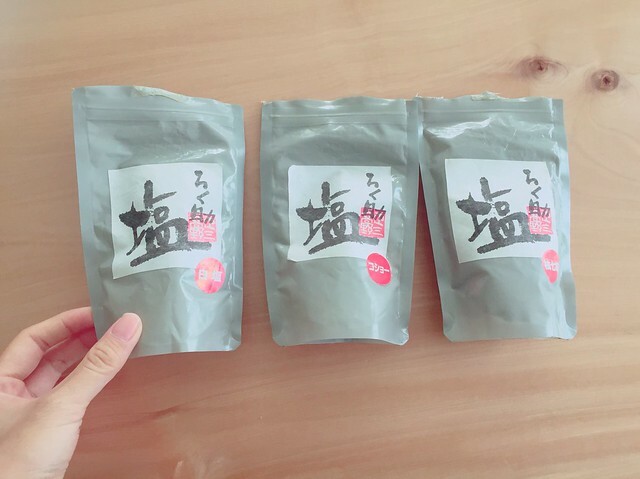 The danna then bought 3 packs (original, pepper and shijimi) for our kitchen. They are, the most delicious salts in the world. They are like freaking umami fairy dust that turns the most mundane food into magic. I used them in grilled meat, and even just sprinkle it in plain Japanese rice to make onigiri. What exactly is it made of??? It tasted like an MSG bomb that will make your stomach rot into mush. But then I checked the ingredient. 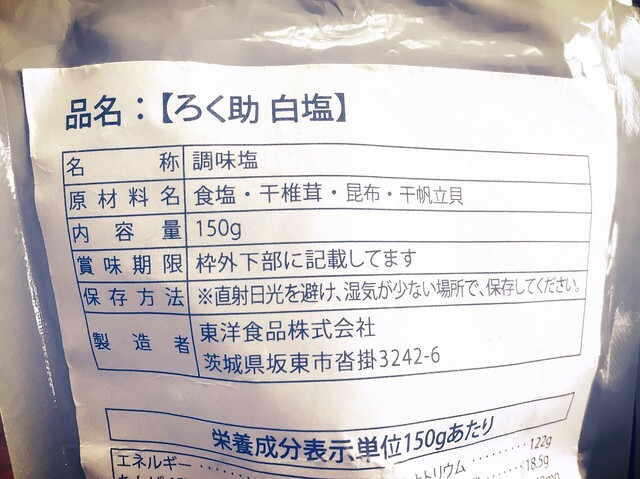 All that was in it, was none other than normal salt, dried Shiitake (mushroom), Konbu, and dried scallop. Anyway that was the scientific side of the story. 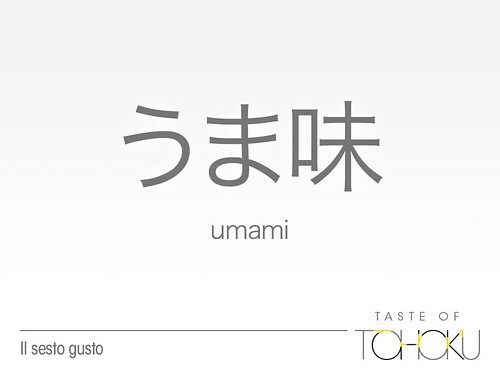 I believe that umami does not only mean the 5th taste, but describes the beauty of a food. And the second meaning would be much more philosophical. The Japanese are using the word way too generously on food packaging nowadays since the very word itself sells. Every single food product screams “UMAMI!!! !” in different kind of expressions printed right across the wrapper. Umami is the IT word. Lest the word become a cheap trick in seducing foodies who buy the whole 5th taste concept, I wanted to know if it carries a deeper meaning to it. Umami exists for people who can appreciate it. While it sounds condescending as if you need some special gastronomic talent to be able to distinguish one flavor from another, it is really simple. When you truly, whole heartedly enjoy a food, feeling blessed and thankful to be able to enjoy something of such great quality, you appreciate umami, and therefore it is translated in the food. It is almost like spiritually communicating with your food. Sounds familiar? Yes, because that is also the roots of itadakimasu and mottainai, too. It’s about beauty, appreciation and respect. Did you know? Miso is also a food that is very high in umami. And you only need very little of it to boost the taste of your food. In Tohoku there are three different sorts of Miso: Sendai miso (a a style of miso, or fermented soybean and rice paste, unique to the Sendai region); Dengaku Miso (sweetened miso to be used as sauce on grilled tofu and other foods) and finally Tokusen Miso (specialty miso). 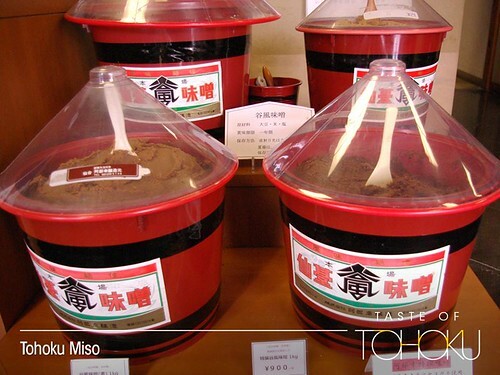 Next time when you go grocery shopping, do pay attention to the different types of miso! 1. If MSG is so bad for you, why doesn’t everyone in Asia have a headache? my mom once asked how come Japanese live so long despite consuming “ahjinamoto” hahah now I know. Read this post like…3 times? Soooo mindblown. Thank you so much. With every post like this, my appreciated and fascination for Japan (Japanese?) just deepens every time. Thank you for this article. Just to share my own experiences, since this year I’ve been very busy and did not cook, most of the time I eat cup instant noodles and I especially love the nissin brands they are the most delicious, but they also contain a huge amount of msg. Cut the story short, I was recently diagnosed with hyperthyroidism. According to some websites which expouse on natural food, an onset of the disease could be a result of eating too much processed food, which I linked to my high intake of cup noodles. Hyperthyroidism can be genetic and I’ve been living with a slightly enlarged neck for good part of my life and it has not gotten worse until now. The other period of time where I had a high intake of food containing msg resulted in an unknown fever for 1 mth. Sensitivity to MSG varies widely. I guess most of us have grown acclimatized to eating MSG, or ajinomoto (especially if one consumes hawker food widely in malaysia). I still personally prefer to stick to natural sources of umami (like the kombu-bonito dashi you talked about, or even ikan bilis stock (iri-dashi!) rather than ajinomoto, though. The latter is processed, concentrated and whilst quite harmless, it does make me very thirsty after consuming it and I do know people with pretty bad reactions to it (eg. vomiting and headaches). I think its like the difference between white, processed sugar and the unrefined sugar products, like gula melaka- its just metabolized differently by the body, subject to personal preference. Thank you for the informative article, Cheesie. I do enjoy reading your writing about Japan. 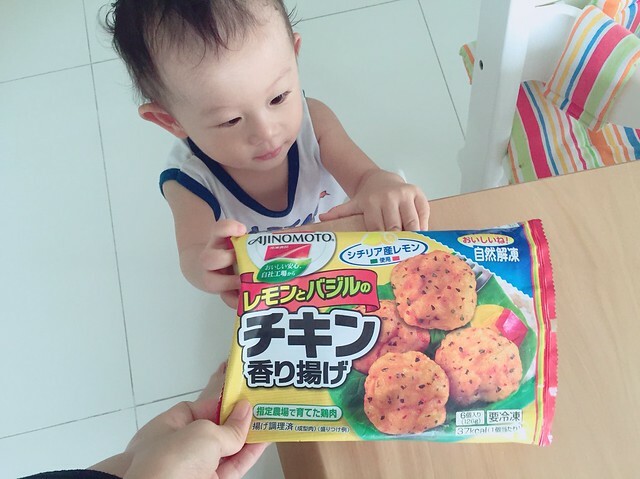 Hi cheesie, can you buy rokusonuke in kl?